How do you properly freeze Oysters? Oysters are a beloved ocean delicacy that is eaten all across the world. From the Asian pacific, European Union, to across the United States, Oysters have always been a popular seafood item that is eaten all around the world. When it comes to frozen oysters, most people believe that frozen oysters lose their original fresh quality when defrosted. product that cannot match the original integrity of a fresh and not frozen (at most times chilled) Oysters. 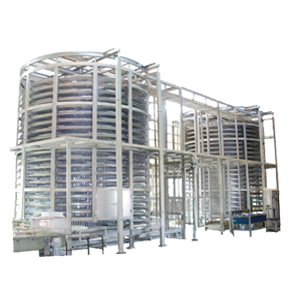 Now that there has been a constant improvement in the freezing technology, flash freezing technology has emerged as new form of freezing products as quickly and efficiently as possible. The main goal for these flash freezers is to work on freezing products while ensuring that the freshness of said product is maintained throughout the freezing process. 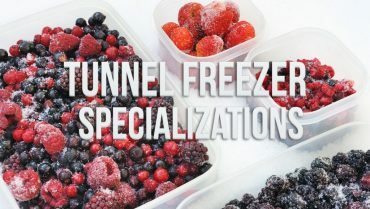 One of the benefits that this new freezing technology is that it can give the food providers the options to be able to preserve and store their product without affecting it’s quality after it has been frozen. This can open new methods and markets for those business professionals that are currently not able to preserve their product for a long period of time due to the affects of regular freezing. Frozen oysters may very become a new high quality option that oyster producers can provide to their dedicated customer base. When it comes to frozen Oysters, most people and Oyster providers believe that selling frozen Oysters will be a lost in the value of their product and therefore their overall revenue and profits will be effected in a negative way with less money for them and a sub-par quality product for their end customers. 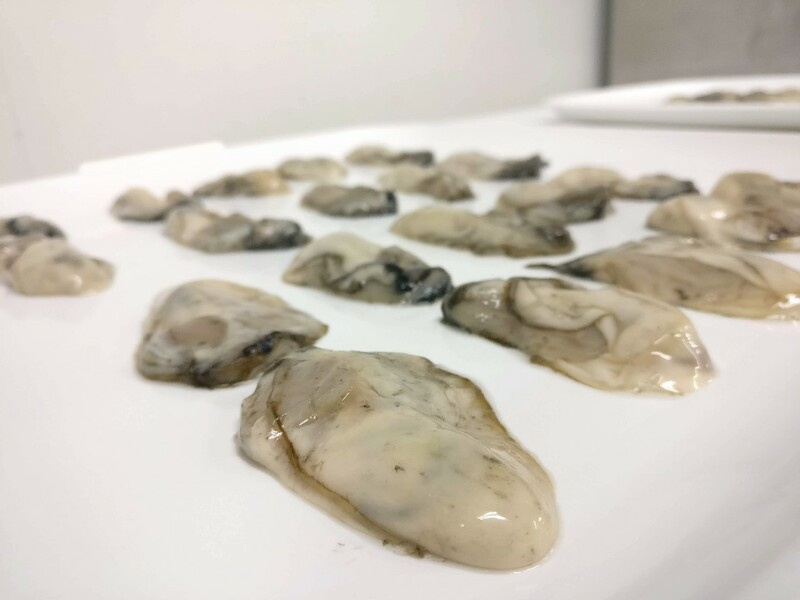 Now that we know that with flash freezing technology is available and it can not only preserve the original integrity of the product, but also maintain all aspects of the fresh oyster, let look at two of the main benefits of frozen oyster and how can oyster producers can benefit from freezing their products. Up until now the price of frozen oysters has been relatively low due to the dramatic drop in quality from fresh oysters. This gives the producers of oysters little incentive to want to store the oysters or invest in freezing technology if they believe that they will not be able to make enough gains through the selling and distribution of oysters. If these same oyster producers were able to retain the fresh quality of oysters even after freezing them, this in term would allow them to keep their oyster stock for a longer period of time while still being able to gain a larger profit margin by offering clients high quality frozen oysters. Flash freezing technology to make sure that their products are able to maintain original integrity and proving to their customers that they can expect the same quality they get in their fresh oysters. 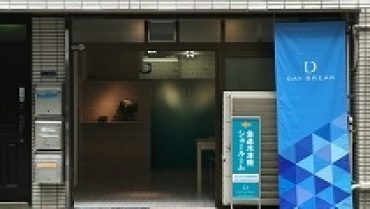 They also get the added benefits of being able to store their products for up to 6 months after they have been flash frozen and then moved to a regular storage freezer with the inlet temperature of at least -30 Celsius which is recommended for products that business owners want to store and maintain the products original high quality throughout the entire storage period. Let us look at the test results. When one things of a frozen product, and more importantly a product so delicate as oysters that can be easily be affected and change it’s original freshness once the frozen oyster is thawed, what the customer ends up with is product that is inferior than fresh oysters. This lowers the value of the frozen oyster and the market for frozen oyster is not as big as fresh oysters. 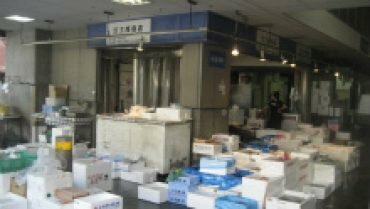 Flash Freezing technology may be able to change this and add more value in the frozen oyster market by increasing the quality of the frozen oyster that the end customers receive from the oyster producers. Now that we know you can perfectly freeze Oysters and make sure that when the oysters are frozen you are still able to retain the original texture, flavor, color, and moisture. On a side note, we actually did also notice that even the smell of the frozen oyster after being thawed is almost identical to the fresh oysters. This can open new markets in the frozen food industry for those oyster producers in the world that want to find new ways to expand their business both in a domestic and international level. 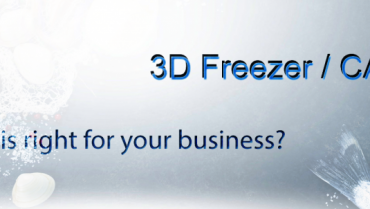 Now, you may be wondering on what flash freezer would be best for your business. 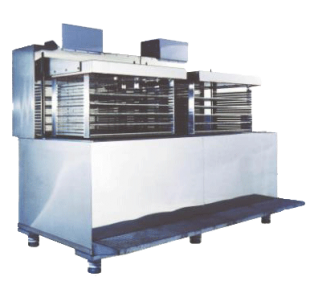 Here are two flash freezer lines that each have different freezer technology, but both focus on making sure that the products are flash frozen. 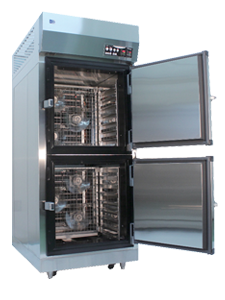 When it comes to blast freezing, 3D freezer line was made with an effective, but simple designed that ensured that the products that are frozen inside the freezer are fully and evenly frozen by using it’s exclusive Anti Cycle Vibration Cold System, or ACVCS for short. 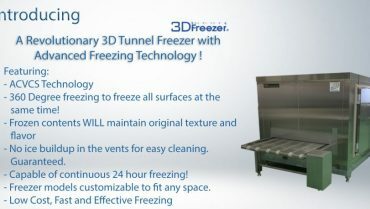 ACVCS technology uses fans inside the 3D freezer to circulate the air within the freezer in a 360 Degree motion to make sure that with freezing oysters, or other products would be frozen directly from all sides, ensuring that the product that is being frozen is frozen from all sides simultaneously which in turn it increases the speed in which the products are being frozen. 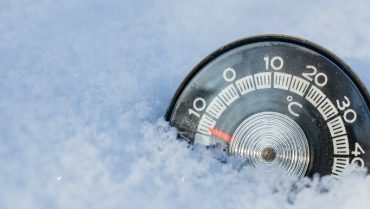 Freezing time can greatly vary depending on the product that is being frozen, but on average expect the product, like frozen oysters, to freeze in 30 minutes or less in the ice crystallization zone of 0C to -1 C to -5 C degrees. As you can see above, other industrial , blast, or shock freezers take a long time (varies, but on average 5 to 8 hours) to reach the ice crystallization zone. Please keep in mind that the longer it takes the product that is being frozen, the larger the ice crystals become. By looking at the image below, you can see what happens between a product that is frozen using flash freezing technology versus a regular blast or shock freezer. 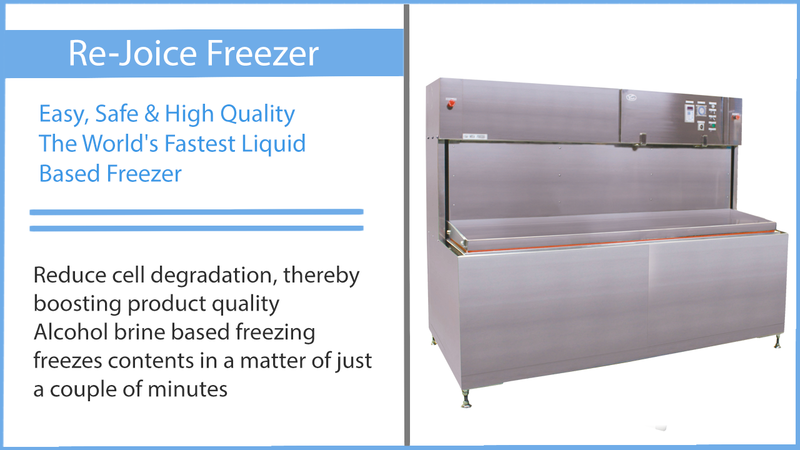 If you are looking for the fastest freezing experience, then you cannot go wrong with the Rejoice freezer line. When it comes to preparing frozen oysters, or other seafood products and you want to make sure that your products is able to freeze quickly and while being packaged, considering Rejoice as a potential good liquid freezing method may be the way to go. Although you do have to make sure your product is well packaged before putting it in the Rejoice liquid based freezer, one of the main benefits of the Rejoice freezer is it’s sheer speed of the freezer compared to other industrial freezers in the market as it uses Brine freezer with a rotating motion within the freezer to not only make sure that the product is being frozen quick and evenly from all sides, but to also make sure that it is frozen extremely fast without using an extensive amount of energy like nitrogen freezers. As you can see above, like the 3D freezer, while using different technology, due to how the Rejoice freezer can efficiently freezer the products to the crystallization point of -1 C to -5 C in less than 30 minutes or less. Fresh vs Flash Frozen Oysters: Which is better? 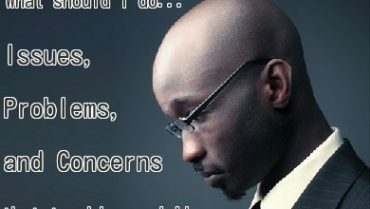 After going through the data that we gathered via tests that we conducted. After going through various tests and confirmations, we noted the following. Frozen Oysters can preserved and stored while still maintaining the freshness of the fresh oysters. With using the flash freezers to completely freeze the oysters but not change the original integrity of the product. 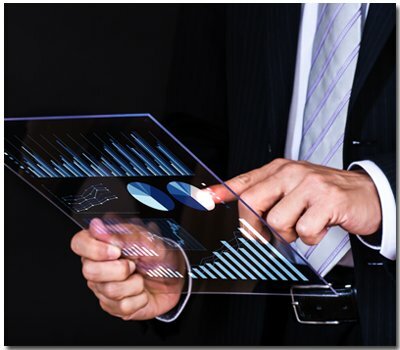 By using flash freezing technology, the oyster producers will then be able to make a new product line for themselves and not only potentially increase sales, maintain a steady supply of product year alone, but it allows the oyster producers to make sure they have quality products for their clients year around. With freezing now an option that they can choose to store their product, as oysters are a seasonal product, they can now focus and increasing their stock when oysters are in season and store their stocks throughout the year to constantly keep stock levels while lowering the amount of product they have to throw away. At the end of the day, giving the customer options of fresh or frozen oysters is good, but making sure the quality of the product does not change regardless of the choose the customer makes is the most important aspect that any business professional in the Oyster industry needs to make it their top priority. 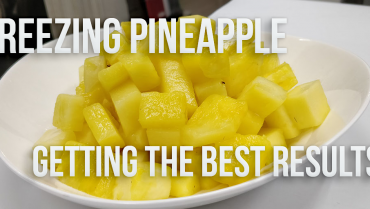 Quality is important, and providing your customers with the best product possible should be the number one goal for everyone in the industry. If you are interested in learning more about flash freezers, please do not hesitate to contact us via the contact page or please feel free to contact us via the contact page via [support.en@flash-freeze.net ] . If you become interested after learning that frozen oysters can maintain original integrity after being defrosted. We invite you to our showroom and conduct your very own test of your product and see for yourself how flash freezing technology can help your business.